Health care is the discussion du jour among the politically inclined. That is, the politically inclined who are capable of debating a topic that appears to have begun legislative deliberations sometime in the Mesozoic Era. At the moment, that group of people includes the Senate (motto: The Lower Our Approval Rating, the More Money We Spend), a half dozen or so pundits who make money by threatening to sic Sarah Palin on the country, and thirteen Iowans who got confused and turned on their collective television set hoping to find it was that magical time when people actually cared about Iowa; that is, either caucus season, or the re-opening of The Music Man. Much like abortions, fully-automatic weapons, and Simon Cowell, half of the country considers health care to be an innate right of humanity, and the other considers it a forerunner to the apocalypse. That is, the Democrats (motto: If You Don't Spend It, We Will), in their usual tradition of trying to appear 'nice', think people should have access to 'doctors', no matter how much said 'access' might actually cost, and Republicans (motto: Don't Worry, We Did) worry that if a certain part of the electorate gets access to medical care they'll be alive and voting Democratic that much longer. To be fair, that's an oversimplification of a very complex and nuanced topic. 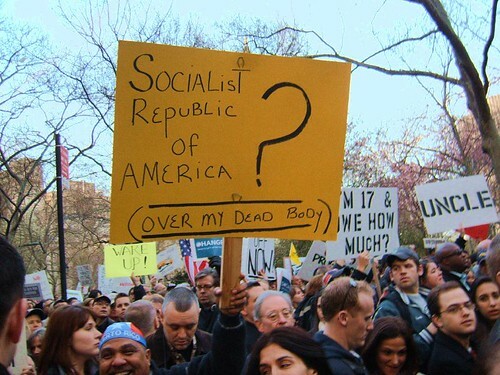 The only way to adequately portray political positions is to carry around large signs calling other people socialists. Speaking from my experience in the UK, Britons, are, of course, overjoyed to hear Americans are looking into fixing the obviously-broken health care system. They'd send congratulatory notes, but couldn't possibly, or they'd lose their place in queue for their routine checkup(s). On a related note, England is closed, pending the return of their doctor (who was sent to Haiti). That being said, there are valid reasons for not reforming health care. In the current system, doctors make a killing, my fellow actuaries are rolling in dough, the jocks-turned-pharma reps who stole all the beautiful women in high school can continue to earn double my salary and pay for various and sundry plastic surgeries, and attorneys like John Edwards can strike it big and be a pox on humanity. On the pro side, however, it would make me look a lot more successful if my family members in the health care industry suddenly took a cut in salary, and maybe I could convince my mom that it was a good idea to pass up medical school in order to have more time to play Battlefield 1942 in school. I'd like to end reminding you that a) only socialists have health care, b) the accidental system we stumbled upon wherein employers provide health care is holy and sacred, and c) like always, the rich should pay for all of it, because I'm all out of cash after that Big Mac. And they should pay for my fancy flying unicorn as well. Well said indeed. Flying unicorns are getting very pricey these days. I'll keep my fingers crossed for you.